Home > What does food have to do with security in the Arab world? This article first appeared in the Arab Food and Nutrition Security blog . As the Middle East and North Africa (MENA) struggles to overcome current conflicts, it is equally critical that the region keeps an eye on long-term challenges to stability such as food security to avoid ‘losing the peace.’ In the face of the unfolding human tragedies of the civil wars in Syria , Libya and Yemen it is hard to focus on, much less respond to, emerging, non-traditional threats . They pose a significant threat to the region’s future, however, and could end up undermining any security gains. The good news is that when it comes to food security, there are actions that can be taken now for immediate benefit while contributing to long-term stability. In a recent book, Emerging Security Threats in the Middle East , food, water and energy security and migration are identified as issues that will become increasingly important. As the Arab region imports over 50 per cent of the calories it consumes, and is the world’s largest importer of wheat , food security has resonance. It is no surprise that the region goes beyond the common definition of food security  and frames it in terms of national security. In the wake of the food price crisis 2008-2009 the Arab region witnessed an additional four million undernourished people. In countries like Yemen seed stocks were utilized one year earlier than planned , thus jeopardizing future food security. Today, exacerbated by conflict, hunger and malnutrition are again threatening Yemen. Even the wealthier regions, such as the Gulf countries face an increasing reliance on world markets to satisfy their food demands. This places them at long-term risk, as the global food trade system has become less reliable. Indeed, as Eckart Woertz  notes, the Gulf Countries have become increasingly wary of the risk of food supply disruptions. Therefore, the Gulf countries have opted to go for land acquisitions abroad to boost their food security and decrease the reliance on world markets. Yet not all countries in the region have the resources to invest in land acquisitions, nor do they have to. There are other solutions. While MENA has the lowest per capita water availability  in the world, it also has the lowest rate for water productivity . There is room for improving the way the resources are managed. This is especially true of the potential inherent in the re-use of wastewater. 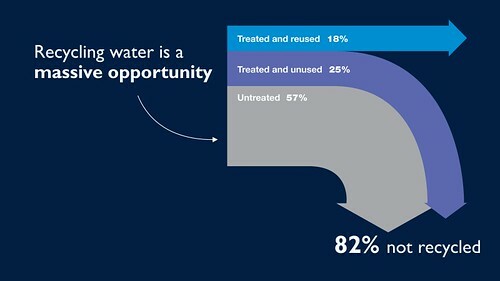 Now, the region reuses less than 20% of its wastewater (see figure below). As noted in a recent report , this low level presents an opportunity. Boosting re-use of treated wastewater would be hugely beneficial for securing a steady supply of water for agriculture, which consumes the lion’s share of water resources. Historically, the countries in the region have focused on achieving food self-sufficiency at the national level. While increased national agricultural production is important, not least since large parts of the population are directly or indirectly dependent on the sector for their livelihoods, it is often not sufficient to provide sustainable food security. Long-term food security in MENA – and indeed, long-term stability  – requires a comprehensive approach that includes effective management of water resources, sustainable agricultural productivity, agricultural trade, and the guarantee of adequate, affordable, nutritious food for all people. In view of the critical importance of food security for long-term stability, it is vital that any post conflict reconstruction  focuses on the many factors that contribute to it. Along with improved water management, income opportunities and effective social safety nets are equally critical. Without them, people will not be able to achieve food security, creating a source of frustration that could lead to renewed instability. While worrying about ways to guarantee the supply of food, governments also need to ensure people have the means to access it. Addressing this combination of factors is critical for countries the region. For countries emerging from conflict it will be a crucial investment in making sure peace holds.